Steadily, more and more of the total internet usage is happening from mobile phones. Some estimates say that 9 out 10 adults have access to a cell phone these days, and the amount of web traffic originating from mobile phones increases every year. 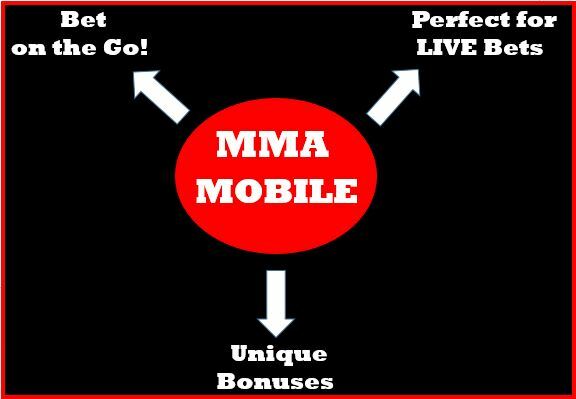 As more of the total internet traffic switches to mobile device, so does UFC and MMA betting action. Nearly every bookmaker reports that, overall, mobile betting is on the rise with their apps growing to rival sportsbook websites in terms of functionality and practicality. It is expected that by the end of 2018 online betting will be more public friendly than before. Until September 2015 most app stores forbade gambling apps, and that remains true on both the Android and Google Play while iPhone does allow fantasy betting apps since 2014. Gambling site apps could be found for Android, but only for statistics follow ups and no real money transactions. But in September 2015 Android platforms silently allowed for both Draftkings and FanDuel to upload their apps, it appears both fantasy betting companies are part of a closed “pilot experiment” for the United States only ( source 1). The way things are going it seems America is becoming more open towards gambling, fantasy betting being the entry point for most sportsbooks. Sports Interaction – Sports Interaction has been around since 1997 and are known for their product innovation. Although they don’t technically have an app, their website is optimized for mobile devices, providing players with a great user experience. You can tell that they’ve focused on the player as it’s extremely easy to make bets, deposit and withdrawal all from your phone. DraftKings App – Now available on both Apple and Google Play Store, Draftkings is one of the first fantasy betting startups in the US, with key investors like Yahoo that now owns 11% of the American company. FanDuel App – Now available on both Apple and Google Play Store, FanDuel is the second fantasy sport gambling site that operates legally inside the US. For a full review on all of the above, visit our Canadian sportsbooks review section. Even though mobile betting is increasingly common, most sportsbooks still don’t offer a native app. While you can use your phone to navigate directly to a sportsbook website and place bets that way, taking advantage of a native app offers a variety of perks including live streaming, results notifications, handicapping advice, money deposits, withdrawals and placing bets on the go. At present, a lot of these features are limited to betting sites based in the UK, but as the American market grows you will see further development. American gamblers for now can take advantage of the fantasy gambling apps. Apple has long allowed bookmakers to offer their apps directly in the Apple Store. You can either visit the Apple Store and download the app you want, or you can visit the bookmaker’s site directly and download it from them. Since September 2015 both Google Play and the Android App Store feature FanDuel and DraftKings apps. Their policies still forbid app developers to sell gambling apps, but that will probably change for 2016. MMA live betting. When you bet live, odds move fast as the fight develops. Gamblers take quick decisions and enter a bet when the odds are just right, and this could happen in a matter of seconds. 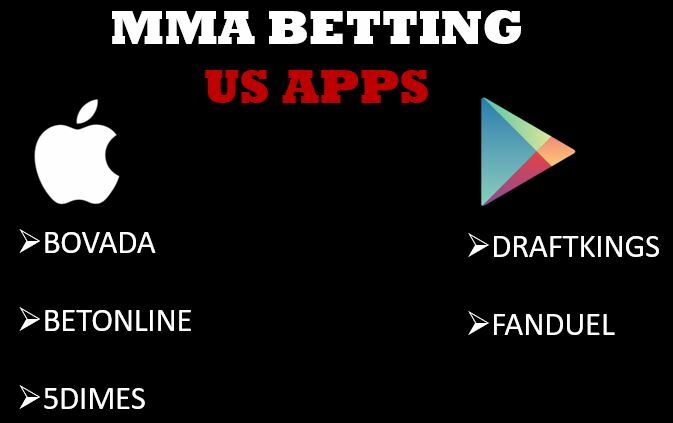 Apps make things easier, especially when it comes to live MMA betting. Bet on the Go. Betting opportunities happen all the time and we are not glued to our desktops, but we can have access to our mobile phones at any time. Receive sound notifications or a program events on your phone to never miss a betting opportunity. Mobile Bonuses. Almost all sportsbooks offer special bonus offers when claimed from a mobile device. One concern many gamblers have when mobile betting, is whether or not the full range of markets will be available to them. We’re happy to report that, in nearly every case, betting on a mobile phone offers all the same markets as betting on your computer, from head-to-head matchups to parlays and prop bets. The biggest advantage to mobile bettors is flexibility. 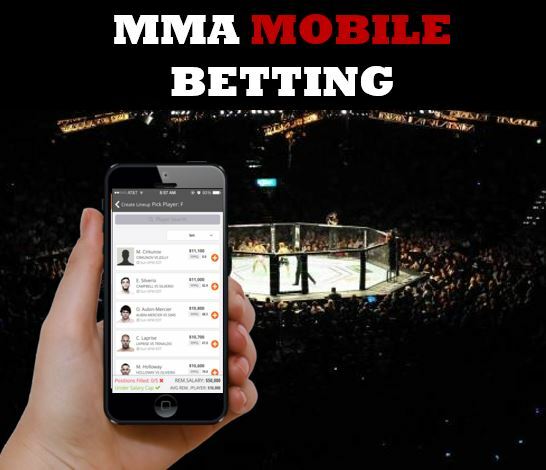 You are out at the bar watching the latest UFC PPV with your friends and want to toss out a last-minute bet Just reach into your pocket and grab your phone. Waiting for a line to drop to the place you want it to be? No need to park yourself in front of a computer and monitor the lines, just get on with your life and check it from your phone. Best of all, many sportsbooks are eager to promote their mobile platforms, which means you have access to some amazing deals. Some sites offer free bets, money-back specials, or more favorable odds exclusively to mobile users. So get out there today, shop around, and start maximizing your profits with the power of mobile betting!